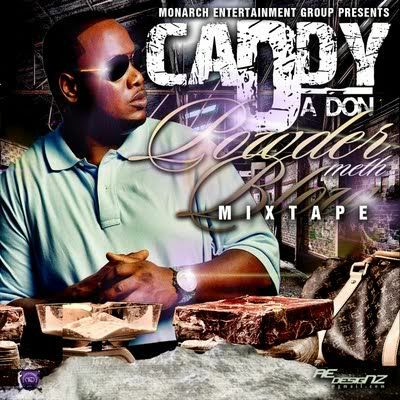 About Mixtape: Caddy Da Don is at the moment, the undisputed hottest artist in the city right now. With a song in regular rotation not only in Baltimore, but across the country, a big video in Miami and a new deal from Tony Austin’s Monarch Entertainment he’s poised to be the next biggest artist in the country. City Paper recognized this by putting him on the cover of their latest issue. All this coming after the independent release of his album back in January. It’s like he put his grind in a slow cooker in the winter and had it nice and ready for the summer. This new mixtape is like him walking across the stage in his cap and gown, paying tribute to what got him here, “Powder Meth Blow”. Overall, Caddy didn’t disappoint at all, in fact, he even raised the bar. He SOUNDS like a dude who has taken that next step beyond the local scene without sounding contrived. This mixtape shows and proves why Caddy has risen above, beyond his grind and push, he actually has undeniable music. If you missed out on his last album, this is definitely not one to miss out on.